You could say that Adam and Eve got kicked out the Garden of Eden for using their noodles a little bit too much. It was their emerging self consciousness - the new life of the mind - that did for them in the end; made them put on clothes and feel divorced from the world around them - the birds, the trees, the dogs. God cursed them for it. 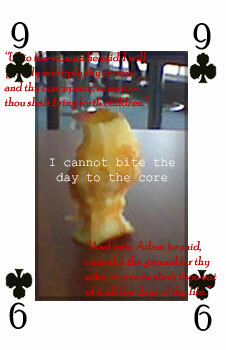 Ever the joker, He tied Adam to the earth by making him dependent on it for food. And He drilled home the physical fact of our much-loved bigger brains by making childbirth that little bit more painful for every woman who ever was. We're all brought forth in sorrow now.